Biggby Coffee - Free coffee or beverage when you join. Caribou Coffee - For every cup of Amy’s Blend coffee purchased on National Coffee Day, Caribou will donate a coffee to caregivers and family members in cancer centers across America. 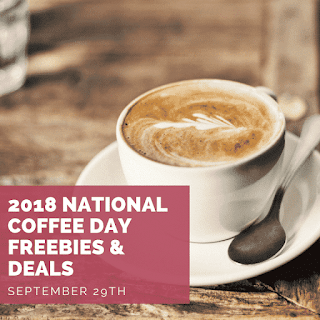 Coffee Beanery - Will be offering any size fresh brewed coffee for $1.00 and $2.00 off a pound of coffee on National Coffee Day, at participating locations only. Kwik Trip - Earn 5 cents in Fuel Discounts when you purchase 2 Karuba Gold drinks with Kwik Rewards on 9/29! Starbucks - 20% off at Starbucks in Target through 9/30 and also BOGO Happy hour on 9/27 3pm-close.